Brothers Tom and Dan Rogers’ grandparents emigrated from Italy to California in 1916 and settled on the property in Madera County that has remained in the family since. At the time, the land was home to pasture, cotton, corn and alfalfa. In the late Seventies, their father, who had been pasturing dry heifers, was compelled by a severe drought to look for something else to do. In the early Eighties, he started planting almonds. By 2005, the entire property of 175 acres was covered in almonds. Today, about 45 acres are out of production. 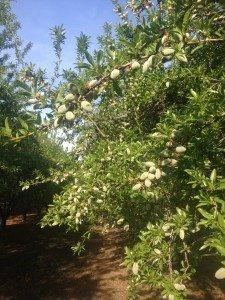 The Rogers’ operation yields roughly 2,500 pounds of almonds per acre. Dan and Tom Rogers rely on groundwater to irrigate their farm. As water has become scarcer in California, they must increase their water use efficiency to ensure their water supply for the future. The brothers are also actively working to reduce their fertilizer usage. A decade or so ago, the Rogers installed a sensor into each of the farm’s three irrigation blocks to measure soil moisture, temperature and humidity. The information is uploaded to the web so that the brothers can see snapshots of soil conditions throughout the day. “We have sensors set at different depths, so we can watch the water move through the [soil] profile,” he said. Going forward, he hopes to install additional sensors to provide even more details on soil conditions. The Rogers brothers replaced the irrigation system on their farm with double-line drip irrigation on all but 22 acres. Along with the change in equipment from less efficient micro sprinklers to more efficient double-line drip, the farmers have changed their approach to irrigating. “What we were taught growing up is you build a soil profile, water it and walk way, and irrigate it again when the soil dries out again,” said Tom Rogers.